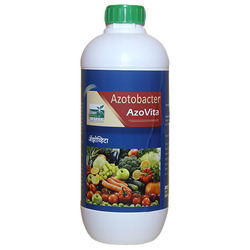 Azotobacter Biofertilizer is nitrogen fixing bio inoculant suitable for all crops. GreenMax AgroTech is capable to produce ten tonnes of technical grade Azotobacter chrococcum per day. This product is also available in combination with Azospirillum as combined formulation. Gmax Nitromax is combined product of Azotobacter and Azospirillum. Azospirillum works well with all crops where as Azotobacter gives excellent results when soils have rich organic matter content (more than 2%). As a combined product of Azospirillum and Azotobacter, Gmax Nitromax combines the benefits of both inoculants in a single formulation. Azotobacter is a freel living nitrogen fixing bacterium. Azotobacter lives in association with plant roots and fixes atmospheric nitrogen in readily available form to plants. Predominant species used as biofertilizers are Azotobacter chroococcum and Aztobacter vinelandii. The important note is, Azotobacter is high respiring organism and hence works well in the soils having sufficient organic matter. The mixture of Azotobacter, Azospirillum (Gmax Nitromax) and phosphate solublizing bacteria (Gmax Phosphomax) can be used for non-leguminous crops-like cereals, oilseeds cotton, vegetable and all other crops which are usually planted as seeds. Drip irrigation Mix about one lr of Gmax Nitromax liquid formulation in 100 litrs of chemicals free, good quality water. Filter the mixture with a pure cloth; use the filtered solution in drip irrigation for one acre.